Struggling BlackBerry maker RIM won’t get a bailout from Canada's federal government, Finance Minister Jim Flaherty has said. Waterloo, Ontario-based Research In Motion “has been a leading company for Canada in terms of research, development and innovation, but it does need to reorganize itself, and that’s something that we expect the leaders in the company to do on their own,” Flaherty said Wednesday, as quoted by Bloomberg. As the Globe and Mail’s Michael Babad points out, that’s a different approach than what the Conservative government took when it bailed out Canada’s automotive sector in 2009. Ottawa and the Ontario government gave the sector $10.5 billion to keep factories from closing in the wake of the financial crisis. RIM has struggled with shrinking sales as consumers have shifted steadily to Android phones and Apple’s iPhone in recent years. Most recently, the company announced it is expecting to record a loss for the first quarter of fiscal 2012. Although its profit margins had been shrinking, the company had so far managed to largely avoid swinging to a loss. 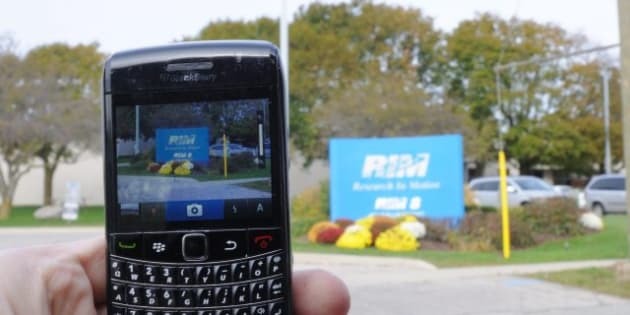 RIM also said it had hired banks JPMorgan and RBC to help it with a strategic, prompting yet another round of rumours that it’s looking to be bought out. That was seen by many analysts as a step towards finding a buyer or at least developing major new partnerships that would allow the company to keep operating. The company is expected to lay off 2,000 to 6,000 workers in the coming months, following the layoffs of 2,000 people last summer and amid continuing weekly layoffs taking place the company.